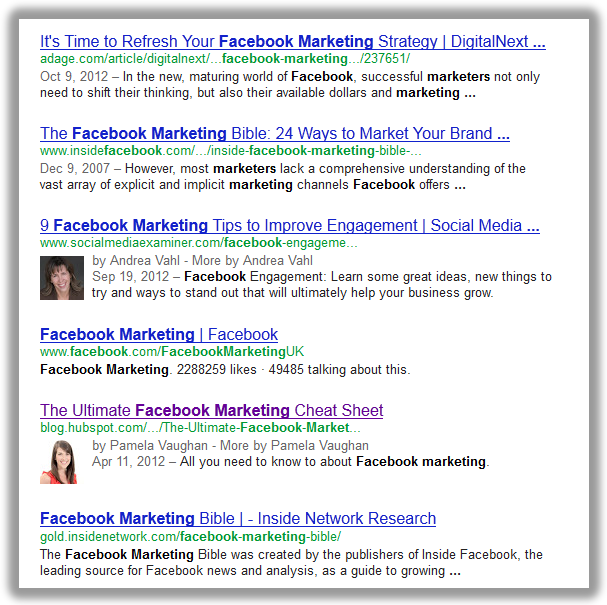 Editor's Note: Since this post was published, Google has removed Authorship functionality entirely. Read more here. Have you ever been cruising through Google's search engine results pages to find that certain results are paired with a thumbnail-sized profile picture of the content's author? Ever wonder how you could make it so your picture accompanies listings for the content you've authored? Then boy is this post for you! 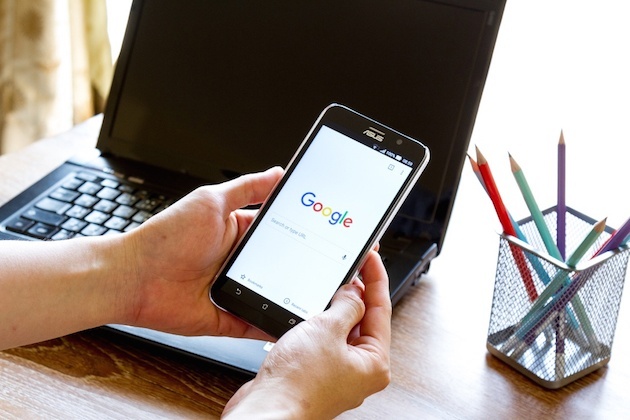 Through Google Authorship, Google allows you to associate the content you've published with your Google+ profile, pulling your profile image and other information into the search engine results for the content you author. The catch? While the process for applying is relatively simple, there seems to be no clear rhyme or reason to whose authorship requests Google chooses to approve. That being said, the application process is easy enough that it's worth applying. In this post, we'll cover exactly why this new feature is beneficial to marketers, explain the simplest way to apply, and disclose some Google-related nuances you should know before embarking on the application process. Ask yourself -- which results stand out? Probably the two with accompanying author images, right? And if your eyes did gravitate toward those two listings, it's pretty easy to understand the benefits. In addition, listings with author images and information attached will likely benefit from a perception of credibility and appease any suspicions of spammy content. Those two listings aren't at the top of this particular SERP either. This means Authorship could give your content a much better fighting chance against other results that might organically rank higher. This is particularly noteworthy considering not many users have taken the opportunity to apply for Authorship, making it well worth it to apply sooner rather than later when, well ... everybody's doing it. And while there haven't been any data-driven reports to surface on the benefits of Authorship yet, we've anecdotally seen a noticeable improvement in the ranking of HubSpot's content that has been associated with our various authors. In other words, it's very possible that Google is rewarding Authorship users with improved search engine rankings. If you're a content creator, that's not a bad perk, huh? Finally, achieving authorship status also entitles you to even more data and statistics about the performance of individual authors' content in search results. You can read more about that from Google here. 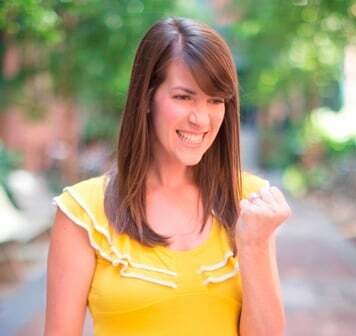 Make sure your Google+ profile page has a profile photo that is a recognizable headshot. 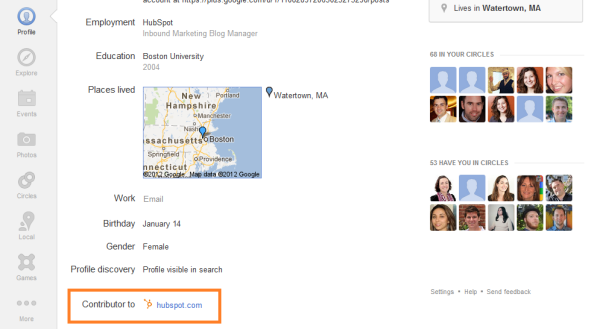 Make sure you have an email address (for example, jdoe@hubspot.com) on the same domain as your content (hubspot.com). If you don't have an email address on the same domain, Google has an alternative method for linking your content to your Google+ profile. Learn how here. In the "About" section of your Google+ profile, add that email address so it's easier for Google to associate your Google+ account with your domain. In addition, make sure each article you publish on that domain has a clear byline identifying you as the author (for example, "By John Doe" or "Author: John Doe"). 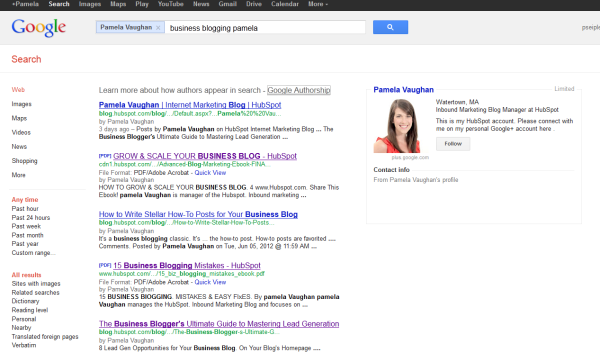 Furthermore, make sure that byline name matches the name on your Google+ profile. 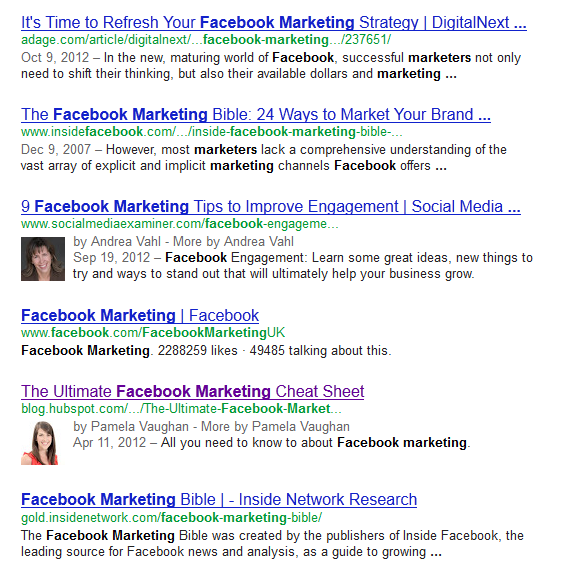 Visit Google's Authorship page, and submit your email address to Google. Regardless of how many articles you publish on this domain, you'll only need to go through this process once. In the "About" section of your Google+ profile, make sure the profile discovery box, "Help others discover my profile in search" is checked. Once Google approves your Authorship request, your Google+ profile will update with the domain on which you're a content contributor in the "Contributor to" section of your Google+ profile (as pictured below). By default, it will also automatically make your email address visible to the public. If you want to keep your email address private on your page, you can change its visibility here. You may also receive an email confirmation from Google once your request for Authorship has been approved. 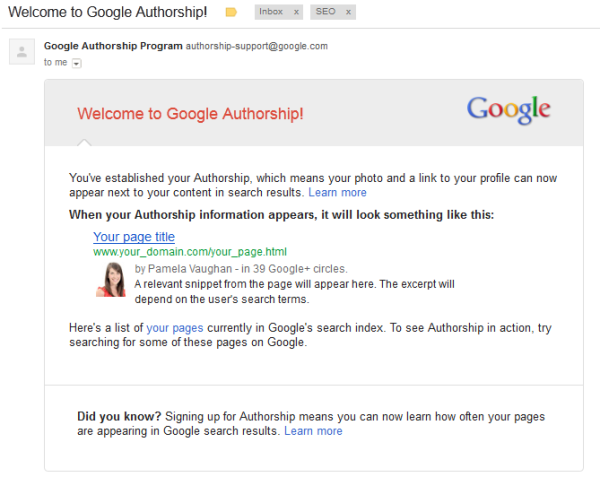 It took about six days for Google to confirm my Authorship request. That being said, it took longer for other members of HubSpot's marketing team to receive Authorship status, and some still have yet to be approved, so it's hard to know how Google is prioritizing approvals. And as we mentioned before, according to Google's Authorship information page, "Google doesn't guarantee to show author information in Google Web Search or Google News results," which explains why some of our authors haven't yet been approved. Remember -- if your website/blog has multiple contributors, it would behoove you to encourage your various authors to apply for Authorship. This way, even more of the search engine listings for your website's content will be associated with its individual author. Many of you are probably aware of Google's various little nuances, and those of you out there who have ever undergone a name change (myself included) -- or whose business uses Gmail for its employees' corporate email accounts (again, myself included) -- are probably all too familiar with the headaches involved in linking and merging multiple Google accounts. Be mindful that if you do suffer from the unfortunate problem of multiple accounts (in addition to content that has been published under different names), Google doesn't exactly make it very easy to sync the Authorship of all your articles to one single Google+ account. While Google has released a tool that enables you to transfer connections from one Google+ account to another and set it as the default destination, Google mentions that Authorship information and Google+ business pages that you manage with your source account will not get transferred to the destination account. In fact, I've personally come to refer to this particular scenario as "Multiple Google Account Hell." My recommendation is to try to connect your Authorship with the Google+ account on which you have the most connections ... and to cross your fingers that Google improves and streamlines this process in the future. Furthermore, while this post explains the simplest way of applying for Authorship, there are other routes you can take. In fact, the folks over at Search Engine Land were kind enough to publish an extremely comprehensive and technical article about those other options here. 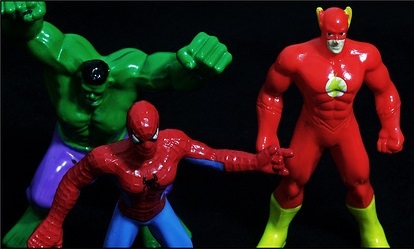 If you've applied for Authorship, have you noticed a boost in your search engine rankings?